Whether you use Retail or Bulk mailing, the Postal Service recognizes 4 types of mail; postcards, letters, large envelopes and parcels. 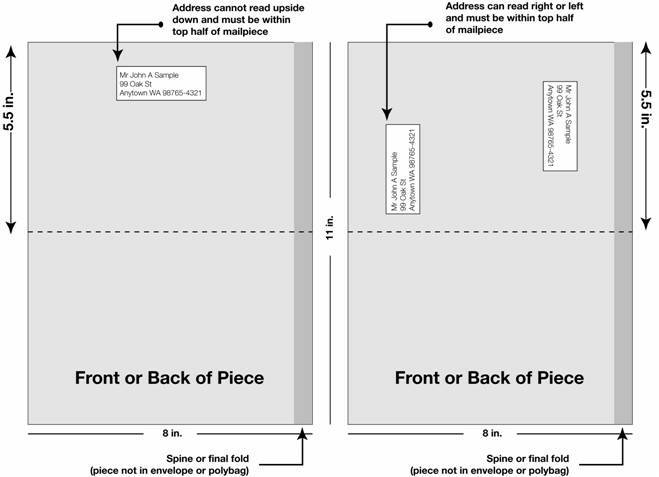 The Postal Service classifies your mail piece by its dimensions. In addition to what we usually think of as a booklet, many newsletters are considered Letter-sized Booklets - Please review postal service requirements or this type of mail. *length is the dimension parallel to the address. For enveloped pieces all of the delivery address must be on one half (right or left) of the envelope. * large envelopes exceed at least one of these dimensions and length is the longest dimension. Parcels may incur surcharges if they are oversized; please review Postal Standards. Design Chart - in September 2009, new requirements for tab positioning and cover weight go into effect. Two tabs on right edge; one tab on left edge. Position lower right tab 0.5 inch from the bottom edge. Position upper tabs 1 inch from the top edge. Two tabs on top edge; one tab on left edge. Position top tabs 1 inch from left and right edge. Position left tab in the middle. continuous glue line along flap preferred, minimum 1inch glue spots acceptable if placed within ¾ inch of right and left edges. ©2011 CLA Community Mailings Mailing Resources | In The News Let's Connect!